At United Way we are committed to helping our children succeed in life through early learning initiatives. ​In 2007 the United Way of Mower County began the Preschool Scholarship Program to ensure our children enter Kindergarten ready to succeed. The United Way Preschool Scholarship Program provides scholarships to 4 year-olds who will be attending Kindergarten and are planning to enroll or are currently enrolled in a Kindergarten Prep Program through Mower County preschools. We work closely with local preschools to determine who is eligible and will be awarded these scholarships. Please inquire at your preschool about the availability of this scholarship and how to apply. Through a grant from The Hormel Foundation and in partnership with SMART and the Parenting Resource Center, United Way of Mower County provides a safe and efficient transportation service for preschool aged children in Austin, who otherwise may not be able to attend preschool due to a transportation barrier. This service is not only meant to be trusted and reliable but is meant to be an affordable option for parents. Bus rides are $1 each way. There are many factors that go into bus placement such as pick up and drop off address, preschool location and time of class. Therefore, we cannot guarantee spots on the Rainbow Route for any child. We do our very best to get as many children on the bus as possible. Click here for the 2018-2019 Rainbow Route application. The 2019-2020 Rainbow Route application will be available by March 1, 2019. 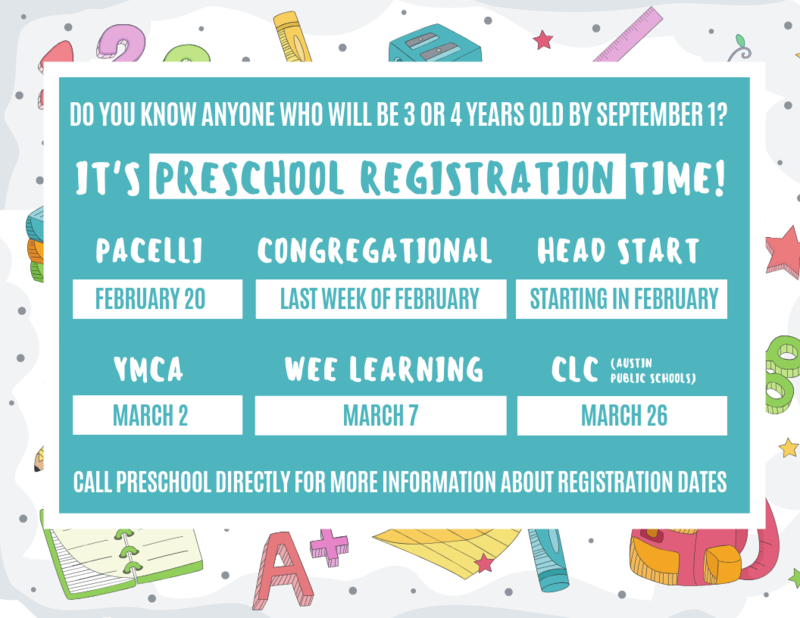 Please be sure your child is registered for preschool before applying. 4 Days. 113 Volunteers. 410 Hours. 1 Big Impact. Thanks to all who participated in each of the 2018 Days of Caring. Your hard work truly made a difference for the staff and families of Catherwood as well as our community. Together we are addressing the challenges of childcare and ensuring a brighter future for many. Thanks to all who were involved in this year's Community Connect event. Over 420 community members were provided with a lunch, groceries, hygiene items, and resources from 43 local organizations. This true collective effort created a sense of hope and caring for those in attendance. United Way coordinates an annual winter coat and outerwear drive to ensure children from families who do not have the financial capability to purchase winterwear items stay warm. The coat drive saw an increase in efficiency this year through the implementation of new procedures. This past year, 251 children received winterwear items through this initiative. If you have children's sized coats to donate, please contact the United Way. Adult sized coats can be donated at the Salvation Army. 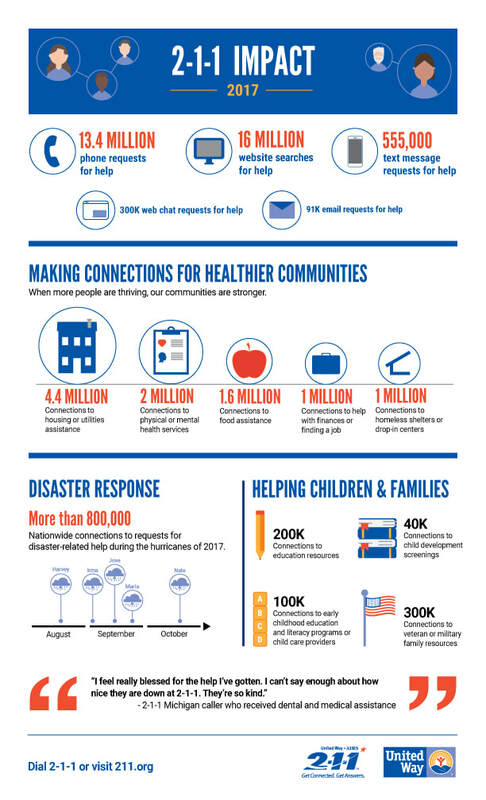 2-1-1 is a free, confidential, multi-lingual information line and website that connects people with the services and resources in their community. Residents of Mower County can dial 2-1-1 at any time day or night and speak with someone who will help them find the help they need whether it is food, shelter, child care, job resources, health care, family services and so much more. Mower County is rich in services and resources but what we have found is that finding those resources, especially in a time of crisis, can be a challenge. 2-1-1 is the one call to make when you don’t know who to call. When you call 2-1-1 you will be connected with a real live person, who has been trained, to assist you. Our call centers are located in Minnesota and interpreter services are also available in over 70 languages. ​In addition to the phone line, you can access 2-1-1 information from the internet as well. www.211unitedway.org allows you to find the resources and services you need right from your computer. Read the website tutorial for search tips and guidelines. The Women’s Leadership initiative was created in 2011 with the goal to align women’s leadership and philanthropy with an urgent community need. After much research the Steering Committee has chosen the community need of ensuring children’s basic needs (K-4th grade). WLI offers you a way to make a direct impact. It is an opportunity for you to be involved with a group of powerful, dedicated women who have built an initiative from the ground up. If you’re a woman looking for a way to make a real difference in Mower County, here’s your unique opportunity. WLI members have a voice in and active role in creating better lives for children. Volunteering, networking and social activities abound. Much research went into determining the community need WLI members would focus on. This research entailed community conversations, public school data, census information, state and federal research, etc. Learn more about the steps and process the Steering Committee took and the business plan that formalized the Women’s Leadership Initiative. Donate here to ensure a better life for the children in Mower County.